Once more it's back to the drawing board for Obamacare -- or maybe just the ouija board that the Supreme Court of the United States has been using to determine its fate. With this court, you never know. Yes, it has a thinker or two who may go to the crux of a case (Mr. Justice Alito comes to mind), but in the main it is mediocrity times nine. And an ever shifting mediocrity at that, depending on where Mr. Justice Anthony Kennedy's seesawing stops that day. All is uncertain at the moment because the circuits on this elaborate gizmo ironically styled the Affordable Care Act (talk about an oxymoron!) seem broken. They keep shooting sparks at each other. A panel of judges on one circuit court of appeals, the Fourth, has let Obamacare stand, if by only the narrowest of margins, 2 to 1. While another panel of judges, this one on the D.C. circuit, ruled against Obamacare by the same 2-to-1 vote -- only to have its decision vacated while the entire circuit court gets a crack at this president's Signature Accomplishment and general headache. But that may never happen because, in the meantime, the Supremes have decided to hear the case, King v. Burwell, that is to determine Obamacare's fate. Again. Obamacare just keeps coming back like a bad penny, or rather a bad trillion dollars, since this administration's take-over, shake-up, or just continual meddlin' with the country's health-care system affects a sixth or so of the whole American economy. Which makes it a matter of some importance to determine whether Obamacare is sound law or just an unreasonable facsimile thereof. For now another "settled question" at law doesn't seem to have been settled at all. And may never be. For nothing is settled till it's settled right. And whatever Obamacare is, the greatest innovation in medicine since penicillin or the greatest step backward since bloodletting, the one thing sure is that its legal fate is still unsettled. And unsettling. This time the Supreme Court's deliberations will have to revolve around the words of the statute establishing Obamacare's subsidized insurance exchanges, the key to financing the whole, big Rube Goldberg-style contraption, and whether those words mean what they plainly say. For the statute limits subsidies under the program to those who have signed up for them through "an exchange established by the state." Which would seem clear enough to those acquainted with the English language. But the administration's lawheads explain that the words actually mean that government subsidies may be obtained through an exchange not established by the state but by the federal government. Maybe you have to have a fine legal education to understand that argument, because to us naifs who still believe words mean what they say -- a belief that clearly disqualifies us for the federal bench -- the words are clear enough. But not for government work. The ever cooperative Internal Revenue Service has already issued a decision supporting the Obama administration's strange (mis)interpretation of the law. Just as the IRS hastened to do the administration's bidding by selectively enforcing the law about tax exemptions. Result: Left-wing outfits got theirs without much trouble; right-wing ones (think Tea Party or pro-Israel groups) didn't. Only when Congress started asking troublesome questions did Lois Lerner, the central figure in that scandal, resign and disappear for a welcome while. Surely she'll be her old, stubborn, defiant, Fifth Amendment-pleading self once the spotlight has moved on. The legal spotlight now is on Obamacare, and not for the first time. For the country's Supreme Court has considered it, and upheld it, once before. Also by the narrowest of margins: 5 to 4, with Chief Justice John Roberts casting the decisive vote. He must have a fine legal mind, too, because he did so by deciding that the fee Obamacare makes mandatory in order for the system to function isn't a fee at all but a tax. No matter what Obamacare's sponsors claimed when it was being debated in Congress. But what do they know? They only wrote the law. Or as the redoubtable Nancy Pelosi, the happily former speaker of the House, explained at the time, "We have to pass the bill so you can find out what is in it, away from the fog of controversy." Call it the pig-in-a-poke theory of jurisprudence, or Buy Now, Pay Whatever We Say Later. But that fog of controversy Ms. Pelosi mentioned has never lifted, and probably never will so long as Obamacare itself is generating questions. Which explains why it's become the legal equivalent of a fog machine. This time one of those questions has reached the country's highest court -- once again. That happens when great questions aren't really decided but just put off. Which is pretty much what the current chief justice succeeded in doing when he let Obamacare survive this far. Chief Justice John Roberts might have gone down as one of the great figures in American law history if he had led the Supreme Court it in declaring Obamacare unconstitutional, and taken his place in history alongside Charles Evans Hughes and Louis D. Brandeis, the justices who led a unanimous court in declaring the National Industrial Recovery Act unconstitutional back in 1935. On the grounds that it undertook to trample on the rights of states and generally regiment the whole economy of a free country. As it did. Furious at first, FDR threatened to pack the court, enact his "signature accomplishment" all by himself, and generally rule by executive order. But once all the dust had settled, an accommodation was reached: The best parts of the old act -- like its protections for the rights of organized labor -- were passed separately, and the worst, like the gigantic public-private trust it created to run the economy, was allowed to die. And freedom to ring. All of which sounds like the kind of compromise this current Democratic administration and this welcome new, Republican-led Congress need to work out where Obamacare is concerned: Keep its more desirable features, like letting young people stay on their parents' health insurance much longer, and let its worst expire -- like turning American health care into one big trust dominated by the country's health and insurance industries. The country's chief justice missed an historic opportunity when he saved Obamacare once before, but that opportunity is knocking again. 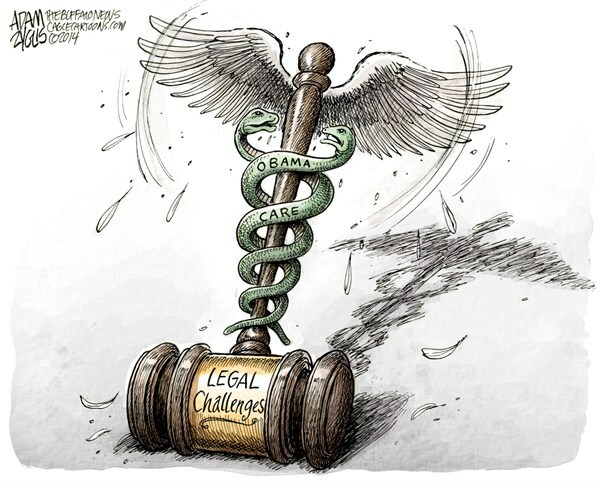 Thanks to the chief justice's decisive decision last time it came up, Obamacare has managed to survive. So far. But stay tuned. Because the only thing sure about the great unraveling of Obamacare is that it is To Be Continued.